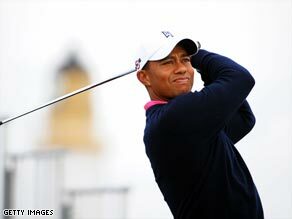 (CNN) -- Tiger Woods will begin his bid for a 15th major title in the British Open at Turnberry in the company of Japanese teenage sensation Ryo Ishikawa and European Ryder Cup star Lee Westwood. Woods was out early at Turnberry on Monday for his practice round. The world number one is looking for his first victory in a major since his return from knee surgery he underwent after winning last year's U.S. Open. The trio will certainly attract large galleries at the Scottish links course with Westwood among the main hopes for a home victory and Ishikawa the emerging star of Japanese golf. Ishikawa, who is now 17, made history two years ago when he won on the Japan Golf Tour, the youngest winner on a major professional circuit. Woods completed his second practice round at Turnberry on Monday and said the course was "a lot more more difficult than people are letting on." "You've just got to do your homework," added Woods who has never played the course before this week. Woods was paired with former European Ryder Cup captain Nick Faldo for a practice round which began at 6.30 a.m local time and he will be up early on Thursday, with his group going out at 9.09 am. With Woods sidelined after surgery, Padraig Harrington won both the Brtiish Open and U.S. PGA Championship and the Dubliner has been handed an afternoon start. Harrington will become the first man since Australian Peter Thomson to win the British Open for three years in a row if he is successful again come Sunday. He partners two former U.S. Open champions in American Jim Furyk and Australian Geoff Ogilvy. Other big name groups see in-form German Martin Kaymer, who is bidding for a third straight win on the European Tour partnering current U.S. Open champion Lucas Glover and South African star Ernie Els. Masters champion Angel Cabrera of Argentina, tees off with Ryuji Imada of Japan and England's Paul Casey.